Telling a story in verse is a risk that could come off as gimmicky in the wrong hands, but Alexander and Rand Hess are pitch perfect in their execution of their words in their new offering from HarperCollins’ young adult division, Blink. Far from stifling the story, the verse adds another layer to the textured teen tale. 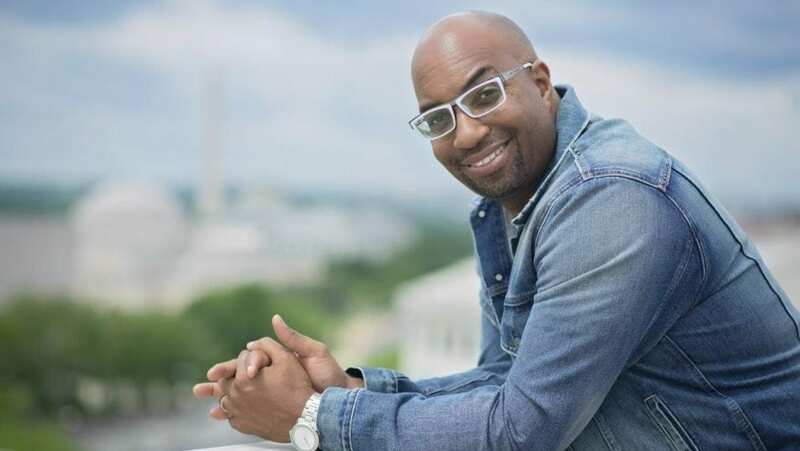 Award-winning author Kwame Alexander, who has a new imprint through Houghton Mifflin Harcourt debuting next year, spoke to theGrio about why he loves young adult fiction and how his role as a parent has shaped his work. theGrio: As an author, what draws you to young adult fiction? Kwame Alexander: If you want to make the world a better place, it’s the children who have to do it. You help them imagine a better world and you eventually get that better world through them. I want to do something to make the world a better place and this is how I do that. theGrio: Writing is often a very solitary process, what was it like working with another author on this book? KA: I’m a big fan of collaboration and I like that process of being inspired by other like-minded individuals. That’s why I’m part of a writing group. We go on writing retreats together. Great source for continuing inspiration. Swing was written with a friend in the writing group, Mary Rand Hess. We knew each other’s voice and we’ve worked together before, so this was an easy match. After winning the Newberry Medal, I was thinking how I could put my friends on and doing collaborations like this is a way to do that. theGrio: Swing is a very rich, rhythmic book with clear imagery. It’s easy to see this on the big screen.. Is there a film adaptation in its future? KA: I’ve been working on tv and film deals with other projects. I could definitely see it happening for this. With Hollywood though, it ain’t a deal until it’s a deal, so I’ll share more about that when I can. theGrio: There are so many important issues out there for young people and you include a number of them here, but at the heart of this book is a very sweet love story. How did you determine what themes you wanted to touch on for this project? KA: I knew I wanted to write a love story. Most of my books are about aspects of love. Specifically, I wanted this to be a love story for teenagers. I had written about sports, but not baseball. I wrote about rock n roll with Solo, so I thought this would be a good opportunity to incorporate jazz. theGrio: So it was important to you to have the light and airy aspects as well as the heavier material. KA: Definitely. I’m a Black man in America, watching the news, seeing the lives of Black men being blown away like sand in a wind storm. We see and feel so many things on multiple levels. In the denouement in the book, you see those layers tied together. We certainly wanted to tell an entertaining story, but also get some larger life lessons in there. For example, we wanted to highlight the value and importance of hugging life. theGrio: Some readers found the ending to be quite surprising. Was that always going to be the ending or did you consider other options? KA: We did have some alternative endings and we put some thought into that. I talked to my 10-year-old about it and she said “Dad, everything doesn’t have to be a happy ending.” I try to write books that are going to help my kid and my kid’s friends and my friends’ kids become more human. My philosophy is to say yes to what’s possible in life. I’m a father and I want to protect my child from certain energy, but I also need her to know that the world is not so beautiful all the time. Children’s lit is full of hope and change. It’s full of imagining something good and better. They need to know that things can be better. Things can be okay. theGrio: What’s next for you? KA: LeBron and Kaepernick have Nike and all the meaningful work they do with that platform, I have Follett. In short, it’s about kids, all kids, having access to books. Kids can see themselves and their neighbors. It’s important for literature to be mirrors and windows. Kids have the chance to learn about not only themselves, but others. Books are like amusement parks. You have to let them choose their own ride sometimes. When I was about 9 years old, I read the autobiography of Muhammad Ali edited by Toni Morrison back in the late 70s and it had a profound impact on me. It was powerful and engaging and I knew there was something special there. I want to provide kids today with the opportunity to also have positive, meaningful interactions with literature. Swing is available in stores and online now.